Occupational Considerations and COPD: Does Work Increase Your Risk? Does Your Work Increase Your Risk for COPD? While smoking is the leading cause of the development of chronic obstructive pulmonary disease (COPD), a variety of occupations have been linked with an increased prevalence of this condition. Asthma is the most common lung condition associated with certain occupations; however, COPD is increasingly correlated with various jobs as well. Currently COPD is the fourth-leading cause of death worldwide and the real number of cases may be higher, since many people receive the diagnosis later on in life when symptoms aggravate and medical advice is sought. Coalmine dust was one of the first toxic chemicals linked with COPD in coal miners. Exposure to toxic chemicals — such as a variety of dusts, noxious gases/vapors and fumes (collectively known as DGVFs) — were found to have a link to the development of COPD. Obviously, smokers who also have high-risk occupations are more likely to develop COPD on top of that. In a large study involving almost 10,000 workers exposed to DGVFs, it was found that 19.2 percent of workers exposed to DGVFs developed COPD, and 31 percent of them had exposure to DGVFs and were smokers. Occupations that increase your risk of developing COPD also include: leather, rubber and plastics manufacturing; plastics and rubber workers; textiles; food products; spray painters; welders; pottery and ceramic workers. 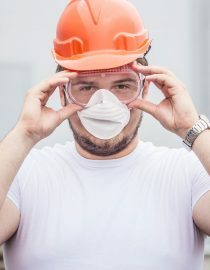 If we look at specific substances linked to a higher prevalence of COPD, we will find silica, quartz, welding fumes, wood dust, sawdust, asbestos and solvents are the most common culprits. Metal gases, cadmium, aluminum production and processing are also on the list. Interestingly, and perhaps less expected, grain and flour dusts have been linked with the development of COPD in bakers, as indicated by Health and Safety Executive, a U.K.-based government organization created to prevent death, injury and health conditions in workplaces. Do your own research and see if the job you are looking for puts you at risk for COPD, asthma or any other condition. Ask the employer if there are any known health hazards linked with your job. If the answer is yes, see your family doctor on a regular basis (annually) and do all recommended tests. If you are diagnosed with COPD or any other disease, seek treatment as soon as possible and explore all options: medications and non-pharmacologic options (such as rehab). If your employer offers an extended health care plan, use the medical benefits offered as needed. Improve your lifestyle including your diet, exercise program and limit exposure to chemicals. If you smoke, quit — and don’t forget second hand smoke is also harmful. You might also like...What's Involved in Being Diagnosed With COPD?